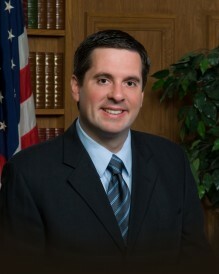 U.S. Rep. Devin Nunes (R-Calif.) is one of 14 members of the U.S. House of Representatives from California who received a “0” rating on LGBT issues from the Human Rights Campaign’s 2010 Congressional Scorecard, which has a rating scale of 0 to 100. Nunes and most of the other U.S. House members with a 0 rating in the state — all Republicans — represent districts inside or bordering on California’s Central Valley, a vast rural and agricultural region in the interior and eastern part of the state. The region has traditionally elected conservative Republicans to Congress and to the California Legislature. Posted September 28th, 2012 & filed under Activism, Politics.